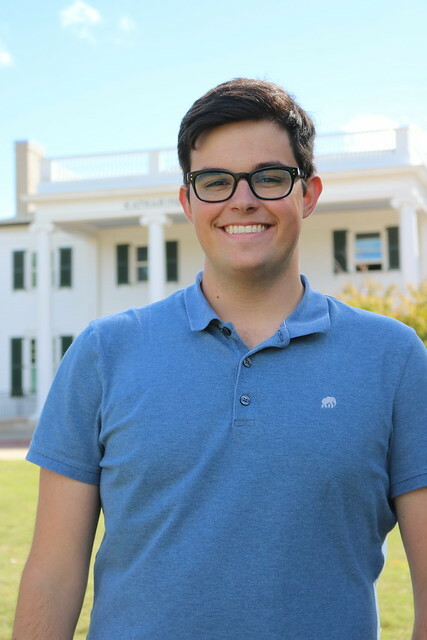 Auburn University student Matthew Rogers has been named a Rhodes Scholar, one of only 32 U.S. students to receive the honor to study at the University of Oxford in the United Kingdom. Rogers, a senior majoring in software engineering, will pursue a doctorate in cyber security. "This is a great honor for Matthew and Auburn University," said Auburn University President Steven Leath. "He has excelled throughout his academic career and he epitomizes the Auburn Creed through his commitment to academic studies, dedication to leadership activities and hard work." As a student in Auburn's Samuel Ginn College of Engineering and the Honors College, Rogers maintains a perfect 4.0 grade-point average and is an undergraduate research fellow working with IBM on a Trusted Platform Module, or TPM, crypto-processor to create secure exchanges of information. Rogers grew up as the son of an Army officer and for much of his life lived on Army posts throughout the country. Since his father's retirement, Rogers has called Huntsville, Alabama, his home. He worked three summers as an undergraduate research intern at the Huntsville-based Dynetics Inc., where he helped develop malware analysis tools. He has given numerous presentations on malware analysis at professional conferences and is a co-author for several internal reports. He has appeared on the CBS Sunday Morning News as well as National Public Radio's "All Tech Considered." At Auburn, Rogers is an Honors College Ambassador, Undergraduate Research Ambassador, co-founder of the Auburn Ethical Hacking Club, past treasurer for the Auburn chapter of the Association of Computing Machinery and a volunteer assisting Cyber Patriot teams in their preparation for competition. "We are so excited for Matthew," said Paul Harris, Auburn University professor of political science and associate director of the Honors College. "He is such an accomplished young scholar, servant-leader and friend, and we wish him well in his studies at Oxford as a Rhodes Scholar. Our entire Auburn Family can take great pride in his accomplishments." Rogers is Auburn's fifth Rhodes Scholar, following Hugh Long in 1949, Ed Gentle in 1978, Susan Karamanian in 1980 and Jordan Anderson in 2009. The Rhodes Scholarship, one of the oldest in the world, is awarded to students with proven intellectual and academic achievement, integrity of character, qualities of leadership and proven respect for their fellow humankind. Founded in 1904, the scholarship is one of the oldest international fellowships and is administered by the Rhodes Trust, a British charity established to honor the will and bequest of Cecil J. Rhodes. Auburn University senior Matthew Rogers was named a Rhodes Scholar on Nov. 18.